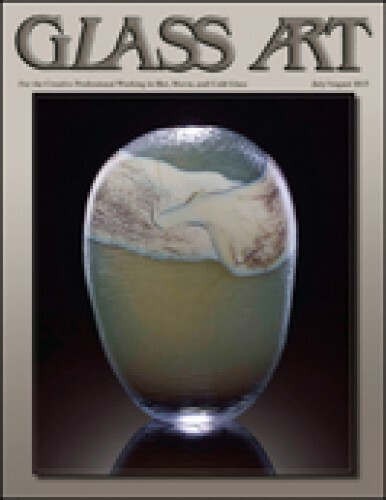 Glass Art editor Shawn Waggoner introduces readers to the international artists who are featured in the summer issue. Amsterdam-based Durk Valkema, American Amy West at her studio in Murano, and Canadian twins, Melanie Rowe and Leslie Rowe-Israelson are just a few of the great artist profiles in this exciting issue. Amy West has studied, worked, and lived on four continents. After many years as an international communications professional, she left behind a successful corporate life to pursue her passion for the art and beauty of Venetian glass. With humor and patience, she meets the challenges of establishing her studio on Murano. Durk Valkema specializes in designing and building cost-effective, fuel-efficient furnaces, annealing kilns, and related equipment, drawing from his broad technical and practical knowledge plus a personal glassworking aesthetic. 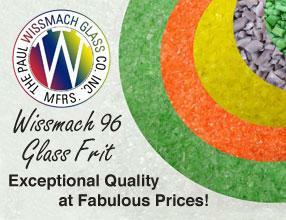 In addition to his own gallery artwork, he also designs and produces glasswork for a number of public clients. The RKD Netherlands Institute for Art History, Vrij Glas Foundation, and the Rakow Research Library at The Corning Museum of Glass are collaborating to digitize the archives of glass artist, designer, and teacher, Sybren Valkema. These archives of the founder of European studio glass provide an invaluable resource for artists worldwide. The Toledo Museum of Glass has had a glass studio longer than any organization in the United States and provided the place, in 1962, for Harvey Littleton to build a small furnace at the museum. 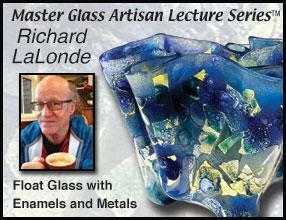 With that, he demonstrated how an independent artist could work directly with glass. North Lands Creative Center has incrementally developed its facility in recent years to better serve the needs of visiting artists and students. Located in the wild, dramatic Highlands region of extreme northeast Scotland, the center recently extended both studio and residential accommodations for visiting artists, makers, and community groups. A reciprocal artistic vision between hot glass artist Brice Turnbull and abstract painter Carl Bork inspired and informed the creation of Light and Rapture. The incorporation of Turnbull’s illuminated roundels in Bork’s acrylic paintings redefined the qualities of three-dimensionality, color, and light, providing viewers with artistic elements never seen before. Ellen Rubin demonstrates how glass molds can be made by creating shapes in wet sand. The sand shapes are then filled with a plaster/silica mixture and allowed to dry completely. The molds can be used to tack-fuse or slump glass into desired, original shapes for incorporation into various projects. A multifaceted, multimedia artist, Robair Bern Devine found his initial creative voice in metalworking and painting hot rods and motorcycles. He recently turned his focus to sandblasting and carving stunning art glass sculptures illuminated with a vibrant, color-changing light system and can produce any image he envisions in carved glass. The Canadian Rockies imbue the sculptural work of twin sisters Melanie Rowe and Leslie Rowe-Israelson with beauty and grandeur. They have unearthed limitless possibilities of technique and material and love the challenge of creating large fused panels that relate to one another, bringing the viewer’s eye to an intricate bead focal point. Members of the Stained Glass Association of America value the organization’s annual Stained Glass Conference, which provides an opportunity to reconnect with old friends, make new ones, and learn from other stained glass artists. These meetings continue, because even with technological advancements, there is still value in meeting face to face. About the time Richard Prigg left a career as an artisan and general manager for Willett Hauser to open his own glass studio, he bought an iPad and a simple iDraw program and became obsessed with lead lines. He still, however, considers color both an essential and a subtle element of composition. The American Glass Guild (AGG) has completed its fourth annual juried show, American Glass Now: 2015, which showcased the recent work of seventeen glass artist members. A large body of exceptional talent was well represented and included works by Kathy Barnard, Joseph Cavalieri, Mary Clerkin Higgins, J. Kenneth Leap, and many others.